There was a time when transcontinental travelers dreaded the flight from New York to Los Angeles or San Francisco. Aircraft comfort and amenities seemed to be going downhill. That’s changed. Great new options: American Airlines and JetBlue are both flying Airbus A321 aircraft on these routes. 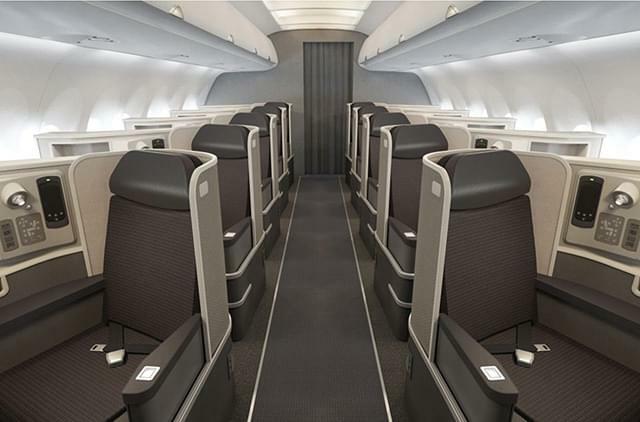 You’ll find first, business, premium economy and economy seating that are superior to the competition, as well as upgraded in-flight entertainment, Wi-Fi connectivity, and improved dining options. Let’s take a look at both carriers. In recent years American has made great strides in improving its in-flight experience especially in the first class and business cabins, although the airline has also devoted attention to its economy and premium economy products. All-aisle access in first class The seating configuration of Americans A321T is one of my favorite features. No more climbing over your seatmate to get to the aisle. Everyone in first class has easy access to the restroom or galley. Or you can simply stretch your legs in the aisle. Fully lie-flat seats in both first and business class This is the game changer for many travelers, especially those flying from New York and connecting to other destinations via Los Angeles or San Francisco. Travelers appreciate the extra comfort of fully lie-flat seats on long-haul journeys. It’s nice to have that level of comfort, even if you’re just flying transcontinental. Nice first class amenities Flight attendants give out Bose noise-cancelling headsets to use throughout the flight, and each passenger gets an amenity kit stuffed with products from the holistic line Akhassa. Six more inches of legroom in Main Cabin Even coach passengers are a bit more comfortable on Americans A321T, since each seat has six additional inches of legroom compared with traditional seating. Main Cabin and Main Cabin Extra (premium economy) seats are 18 inches wide. Main Cabin pitch is 31 to 32 inches, while Main Cabin Extra pitch ranges from 35 to 37 inches. Universal AC power outlets and USB ports at every seat Everyone boards a plane with an assortment of electronics these days so in-seat power and USB ports are a nice plus. In-flight Wi-Fi This is a boon for anyone who has to get some work done on the flight, as well as those who want to catch up on their email. In-flight entertainment The airline upgraded the personal in-seat entertainment systems to include 200 movies, up to 180 TV shows, hundreds of audio programs and even 20 games. JetBlue just launched something it calls Mint. This is the airlines take on premium service, and initial reviews indicate that travelers are quite happy with the product. There are three things that make JetBlues premium service from New York to Los Angeles (and San Francisco starting this October) especially intriguing: the price point. It’s as low as $599 one way. And it features, fully flat seats and private suites. 12 fully lie-flat seats Mints fully lie-flat sets convert to beds up to 6 feet 8 inches, and are approximately 22 inches wide. Seats have air cushions with adjustable firmness, as well as a built-in massage function. Four private suites You might think you accidentally boarded a Singapore Airlines flight when the flight attendant seats you in your private suite, which even has a door. These are the only suites offered in the American domestic market. Comfortable economy seating Coach and Even More Space (premium economy) both offer 18-inch-wide seats. Coach pitch is 33 inches; Even More Space pitch ranges from 37 to 41 inches. Amenity kit Mint passengers receive a customized man’s or woman’s amenity kit from Birchbox. Dual 110-volt power outlets and two USB ports Like American, JetBlue offers both in-seat power and USB ports. In-flight entertainment As with other JetBlue routes, the A321 transcontinental offers a 15-inch flat screen with more than 100 channels of DirecTV and more than 100 SiriusXM satellite radio channels. Wake-me-up service Mint seating offers a neat Wake me for service indicator so you can customize when you want to sleep and eat during the flight. Unique tapas-style menu and gourmet desserts Here’s something else that sets Mint apart from other airline options: its new tapas-style dining menu, with offerings from New York City’s Saxon + Parole. Desserts are from Blue Marble Ice Cream and Mah-ze-Dahr Bakery.